This is common information related to all of our Fallen Soldier Battle Cross statues, but it is important information that you should read at least once. 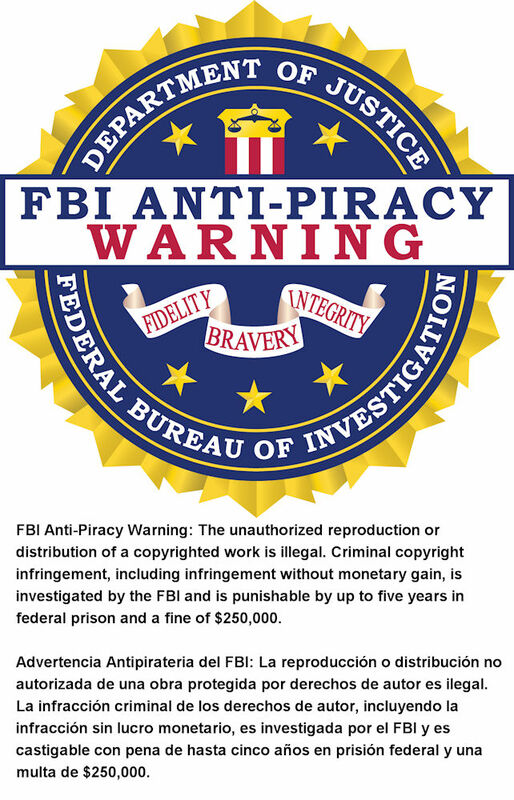 First, it is very important for you to know that this is copyright protected artwork, and registered with the US Copyright Office, registration number VAu000697427. 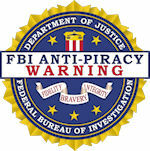 Due to a never-ending battle against copyright infringement, I include the following warning. Richard Rist, the artist and owner of The Large Art Company, is a veteran and a life member of the VFW. His only brother Jim is also a veteran, as was his father, grandfather, and many uncles. After 9/11, and the beginning of the war in Afghanistan in 2001, Mr. Rist began getting calls from parents and spouses of members of the armed services who were killed. These families were hoping to build a memorial to their lost loved one, but unfortunately there were no pre-made sculptures to offer, and getting anything custom-made was beyond what they could afford. After several of these heart-wrenching phone calls, Mr. Rist decided create a memorial sculpture at his own expense. As Mr. Rist was contemplating a design for a memorial sculpture he viewed numerous pictures coming back from Afghanistan and noticed that it was common to arrange the boots, rifle, and helmet of the fallen service member; and the surviving members of their unit would pay their respects. Mr. Rist felt that if this arangment was a suitable memorial for the troops in the battlefield, it was good enough for him. So in late 2002 began recreating this battlefield ceremony. The sculpture was completed in 2003, and he would call it the Fallen Soldier Battle Cross. Since Mr. Rist was the first to create a sculpture of this arrangement he filed a copyright application for the arrangement and the title Fallen Soldier-Battle Cross with the US Copyright Office. That application was approved and the registration number is VAu000697427. So if you see any 3 dimensional reproductions of this arrangement, they are in direct violation of Mr. Rist's copyright, and subject to civil and legal penalties. All original works include the inscription (c) 2004 Richard Rist. 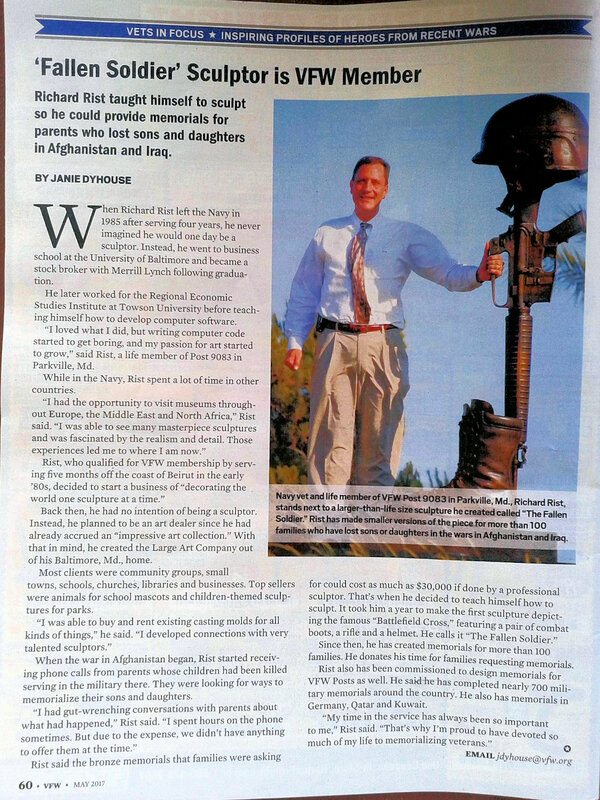 Mr Rist has gone on to dedicate his career to creating bronze statuary for military and veteran memorials and monuments. The Department of Defense has recognized Mr. Rist's copyright, and has worked closely with him over the years providing samples of various pieces of military gear to be used as models for future sculptures. 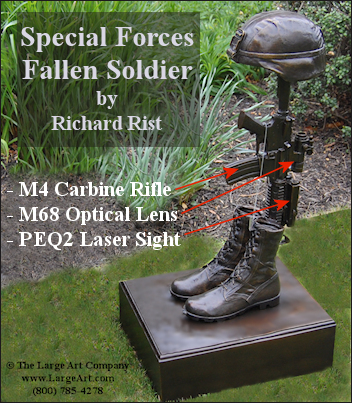 He created Fallen Soldier Battle Cross sculptures for Special Forces using the newest M4 Carbine rifle with a PEQ2 Laser sight, and an M68 Optical Lens (scope). He has created similar sculptures using Vietnam era equipment as well as sculptures for WWII and WWI. He later created a sculpture called Taps, that symbolizes the sacrafice of our military over generations of service. In 2007 Mr. Rist was commissioned to create a Fallen Soldier Battle Cross at two times life size. 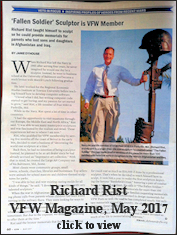 In May 2017 Mr. Rist was featureed in VFW Magazine for his work on military and veteran monuments and memorials.